As the sixteenth annual America Recycles Day launches nationwide, The Times Square Alliance will continue to ramp up the number of Big Belly solar-powered waste and recycling stations in Times Square, bringing the total to 46 stations across the district this week. The pilot program launched in March 2013 with just 30 stations and was funded by a $250,000 grant from the Alcoa Foundation. With support from Mayor Michael R. Bloomberg, Sanitation Commissioner John Doherty, Alcoa CEO Klaus Kleinfeld, Big Belly CEO Jim Norrod and Times Square Alliance President Tim Tompkins, the program is the largest public space recycling initiative in New York City. 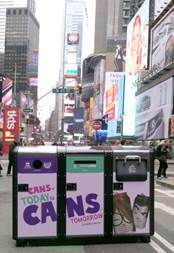 Since the pilot program, data from the Big Belly units has revealed that they have significantly increased the capture of recyclable waste in Times Square, while cutting back on the frequency of waste collections by the Times Square Alliance’s sanitation team. This shift has freed up the team to spend more time on other efforts to maintain quality of life in the district, such as sweeping streets and bussing tables in the plaza. Data is collected from the stations, which are equipped with monitoring systems to measure fullness and frequency of servicing, and then transferred via WiFi to Big Belly’s customer website where operators can access reports on collection and efficiency. The stations have collected 18 tons of bottles and cans and 12 tons of paper as recyclables. Combined, this amounts to 25% of the Times Square waste stream being diverted to recycling. The stations were serviced by Times Square sanitation workers on average 4.2 times per week compared to regular trash cans which had been serviced 4 times per day. The stations were emptied with an 84% efficiency rating. A station is emptied efficiently when it is determined to be half or completely full. The most-used stations by volume were located on Duffy Square at 46th Street and Broadway. Ron Gonen, deputy commissioner of sanitation, recycling and sustainability, NYC Department of Sanitation, said: "New York is the world's city. Having comprehensive recycling infrastructure in Times Square demonstrates to the world how important recycling is to us here in NYC." The announcement comes as communities across the nation celebrate the sixteenth annual America Recycles Day (ARD) on November 15. Organized by Keep America Beautiful, ARD is the only nationally recognized day and community-driven awareness event dedicated to promoting and celebrating environmental education, citizenship and action.